We bring all of the “Elements” of uncompromised fine tailoring together that enable you to enjoy legitimate, true custom clothing at a variety of different levels and price points. All of our clothing is made in our own workshop, on the laps of individual tailors rather than made in separate factories on a production line. All of our clothing is individually cut one at a time from each client’s individual pattern. Our suits are “custom made”, in the true sense of the word, not to be confused with made-to-measure, which is a very different process and often assumed as the same as custom made. Our “True custom” clothing (as opposed to “made-to-measure”) involves the making of an individual pattern from scratch for each client addressing their unique shape and distribution of individual measurements. Thereafter, each suit is cut one at a time for that client by a dedicated cutter, who only cuts the suit before handing the cut fabric off to a coat maker who assembles the coat over the course of several days and a separate pant maker who makes the pants over the course of a day. 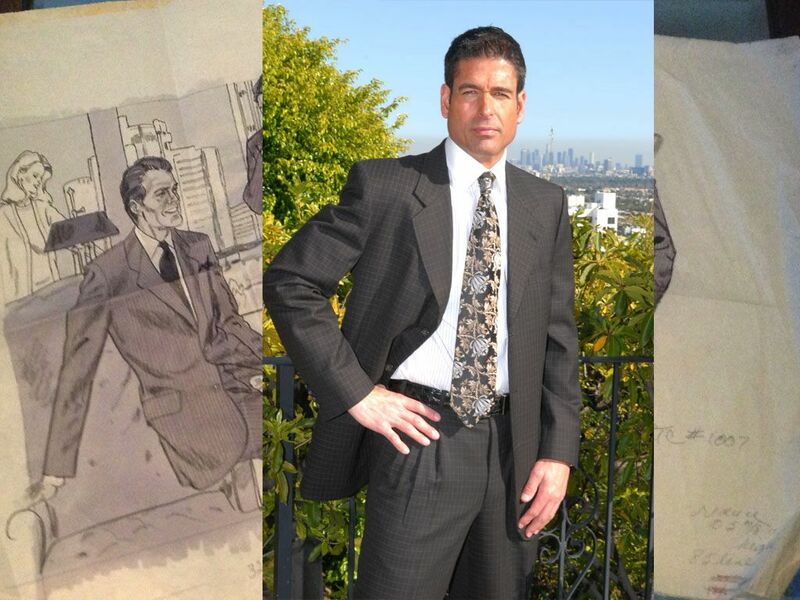 We have a Master Tailor on our Beverly Hills premises. Mr. Chow has all of the same cutting and pattern making skills as our tailors at our overseas workshop along with 70 years of tailoring experience! We offer Mr. Chow’s amazing skills to perfect your pattern for the ultimate fit to your clothing. Mr. Chow spent 20 years running the Mandarin Hotel tailor shop in Hong Kong making 900 to 1000 suits a month. He is a valuable asset in modifying and recording changes to establish our new client’s patterns. On occasion, he will cut and prepare the initial suit for a “try-on” fitting thereby helping to establish the client’s pattern for perpetuity. We’ve developed formulas and inspection systems that produce nearly a 100% consistent result in delivering perfect fitting clothing, incorporating any changes relative to the fit of the last, or any previous order. While we refuse to compromise in terms of the ultimate “fit” of our suits, there are choices that can be made to vary the cost of our suits in terms of your choice of fabrics as well as the amount of handwork that goes into the making of your suit. Just as Mercedes Benz and all other automobile manufacturers offer different price point models in their lines, you can choose and evaluate what “suits” your immediate needs: a 600 AMG, a “550 S”, or an E350. The “fit” will remain a constant, while you may vary your choice of “models” according to your immediate requirements and budgets. There are varying degrees of labor that go into the making of a suit. 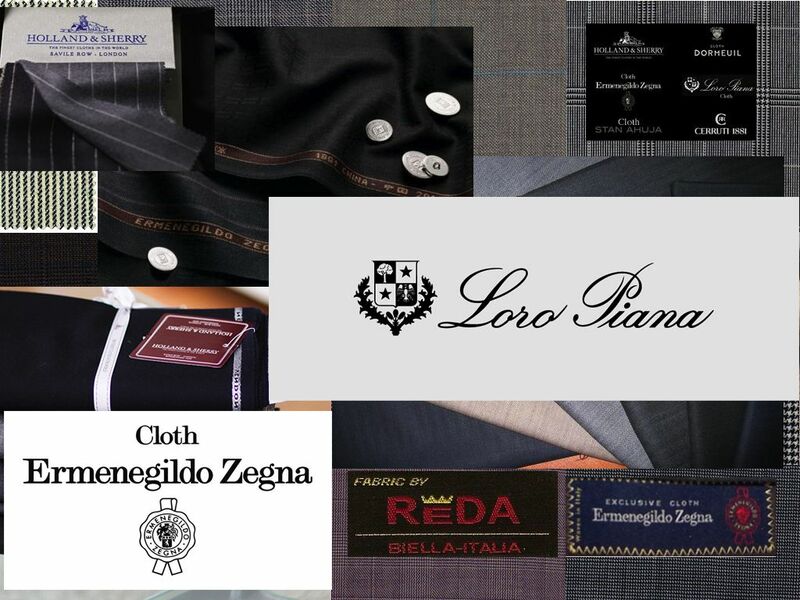 We will discuss with you, and give you an education and examples of the various levels of workmanship for our Silver, Gold and Platinum lines of custom made suits. We purchase some basic fabrics in quantity to enable you to enjoy savings on fabrics that have passed our requirements. Some of these are “house” fabrics on the shelves, just one of a kind of each while others are “bolts” purchased and shipped to our workshop, with swatches and sometimes sample suits or blazers made up to see. We will present our Wardrobe Plan Program to you and explain how the savings can be combined with the various levels of workmanship that we offer. With Wardrobe Plan savings of up to 33%, you may decide to select the fabrics and the workmanship of our Gold Line of suits, while reducing the “average” cost to the price of a Silver Line suit. Our objective is to make you the finest quality, most well coordinated perfect fitting clothing with a minimum of effort on your part. That includes the process by which you order, as well as the manner by which you receive your clothing. Throughout the process, we take every step to make your experience as “seamless” as possible, including messenger services or UPS for new clothing as well as alterations. 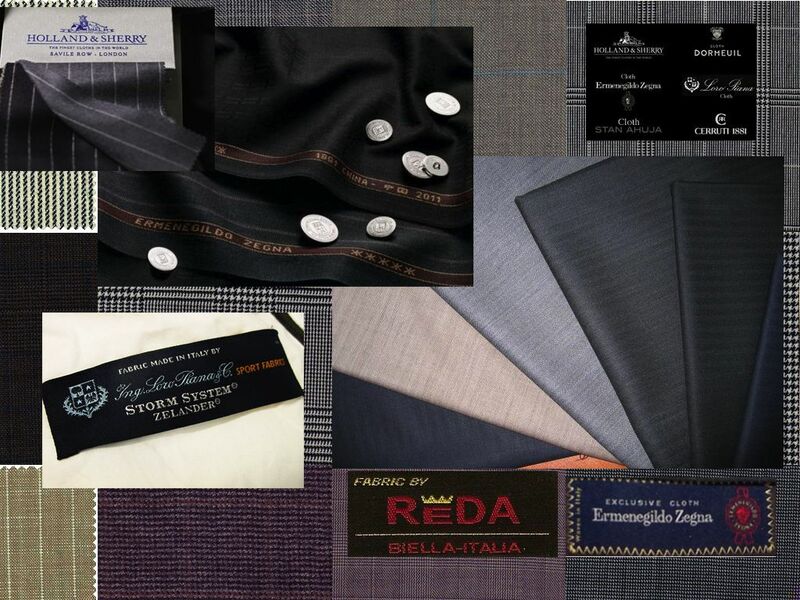 We have over 200 swatch sheets representing nearly any color and pattern of suits, jackets, slacks, tuxedos, shirts, shirt/slack combinations that are sent by mail, FedEx or email from which clients then place orders by phone while we refer to their file of previous purchases. A “Menu” of these swatch sheets is available with our Swatches. Ordering a new suit, jacket, slacks or a few shirts can be reduced to a one-minute investment of time with either a quick phone call or an email. 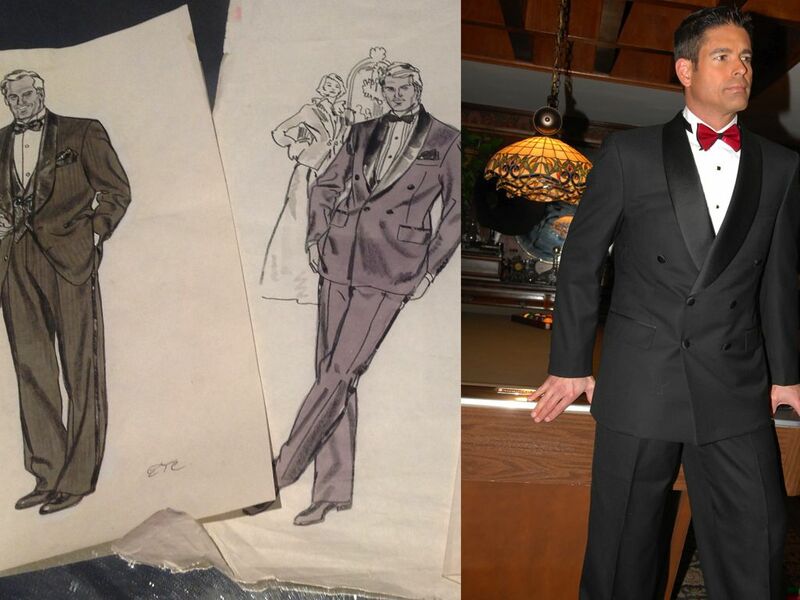 Custom clothing (including the made-to-measure variety) usually involves looking at sketches from a stylebook and visualizing the finished made up article of clothing. While we also take that traditional approach, we also have assembled over a 40 period, a design collection which is featured on this website under “Style Collection”. Each Sample style has a “Style number which allows us to duplicate any one of these unique styles made to your own pattern, plus or minus and changes. These stylized jackets, suits, tuxedos, leather jackets shirts have found their way into hundreds of our long time client’s wardrobes; ideas they undoubtedly wouldn’t have chosen had they not been able to see or even try on the samples. Many of these samples have been intentionally “over styled”. One client might order a new jacket to the exact style of the sample while another might choose to, for example, eliminate the suede trim over the pockets. We strive to keep you well dressed without compromise of quality, workmanship or the use of your time in perfect fitting beautifully made clothing that can be made affordable by combining variables including choices of fabric ranges, the amount of handwork and optional Wardrobe Plan savings. We save your time by making easy, yet personal ordering available to you with a sample collection of styles and hundreds of different swatch sheets. We give you the ability to pay monthly by automatic deduction at whatever amount is comfortable for you, with savings and bonuses to keep new clothing flowing into your wardrobe. Give us a call today to set an appointment or to discuss ideas for new clothing.